The blog has been inactive recently because the weather in the Deep South has been profoundly, well, boring. After a brief cool spell brought on by a pair of cold fronts, we saw a return to the high 80s and further intensification of the drought. For Jackson, it was in fact the driest September on record and the maximum temperatures were among the highest (though the cool overnight lows resulted in a moderation of the overall daily averages). Incidentally, with the warmup came an increase in the number of red paper wasps that—apparently re-energized by the heat—wanted to use my house to overwinter, and one of them decided to light on an antique doorknob of virtually the same color as itself. If you have never been stung by this type of wasp before, believe me, you do not want to be. If cumulonimbi materialize, unplug your computers, modems, and printers. Trust me on this one. 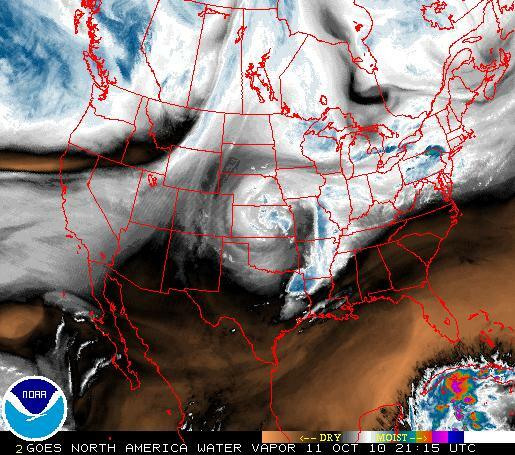 The curved form over Kansas is the upper level low. The leading edge of it is already approaching the area, and you can tell the difference between even the current humidity of the air and what is coming our way. Drier air has already been pushed out, as you may have noticed from the widespread cumulus cloud formation today. LOW AND MOISTURE WILL CONTINUE TO INCREASE AHEAD OF THE SYSTEM. What all this means is that we have an interesting setup for mid-October unfolding and that if all the parameters come together, we could see some severe weather along with our rain. Probably not tornadic activity, but some significant thunderstorms could develop. Meanwhile, in the tropics, we’ve already seen Hurricane Otto come and go and are now on to Tropical Storm Paula. Otto was never a threat to anyone, but it was interesting to observe a classic subtropical-to-tropical transition take place. It also became a hurricane, which is uncommon with systems that begin as subtropical cyclones. Paula has been a persistent disturbance for quite some time before finally getting its name (later than it should have, in my opinion) as a 60 mph system. It is not moving fast and is not expected to pick up much speed, but it will be moving over some warm water and should intensify into the season’s ninth hurricane. It is probably not going to be a problem for the central Gulf Coast, and is more likely to be yet another Florida event, but right now its forecast is uncertain because steering mechanisms are expected to essentially disappear in 3 days, leaving it drifting around in the Yucatan Channel as (probably) a hurricane. Most of the guidance then has it picked up and hauled northeast, and that is indeed the most climatologically likely track for systems of this kind at this time of year. However, storms in this general area in October are infamously hard to forecast; a particularly unfortunate example was Hurricane Mitch. Paula is likely to be an interesting system to watch and a troublesome one to forecast, and in that respect it is actually a welcome change of pace. Heretofore my synopsis of the 2010 hurricane season would be “a whole lot of normal.” Not normal numbers, of course; the season has obviously been above average in activity, but none of the systems except Hurricane Alex were particularly difficult to forecast or did anything unexpected. I like late season storms because they require a bit more of the human factor in forecasting. There isn’t much to say about the weather in the Deep South, unfortunately. A cold front is set to move through the region this weekend, dropping temperatures down about 10 degrees again and making the air outside seem truly fall-like. However, it is going to be a dry cold front. Nothing has changed as far as rain is concerned; there is none predicted as far as the forecasts are made. The Weather Service in Jackson has begun issuing fire weather products for the state, and the office out of Birmingham has issued red flag warnings. Burn bans are also in effect for large areas, though it’s highly inadvisable to burn even if you aren’t officially under a ban. It’s hard to believe that within a half a day’s drive, the Carolinas are getting drenched with the rainfall of a trough and the remains of Tropical Storm Nicole entrained into the cyclone, while we in the Deep South are now officially under drought conditions. With the state as parched as this, it’s reaching a point where we will look anywhere for something that might send us some moisture—or at least, that has not yet been eliminated as a contender for doing that. Out in the tropics, there is a new system in the Central Atlantic, 97L, probably one of the last to develop in places like that this year. However, while the track and development of this system are still very much up in the air, the 12Z GFS doesn’t seem particularly interested in the disturbance. It does, in the two-week range, show a big, wet cold-core cyclone coming through the Southeast and finally ending the drought. I am going to keep an eye on this model and see if it retains this feature; the models are beginning to show some skill in long-range forecasts. And besides, hope springs eternal. Fall at Last, But When Will We Have Some Rain? Over the weekend, an extremely welcome cold front passed through the Southeast, finally giving the record high temperatures and the persistent high pressure system that generated them a kick out the door. No 90s in the foreseeable future. According to Jackson NWS, this should finally begin a fall pattern in which troughs periodically pay the Southeast a visit. The front didn’t make a dent in the drought conditions that have developed over the area in the past month, however. It brought cool temperatures and rainfall to select areas, but most places just didn’t get much. Columbus AFB recorded less than a tenth of an inch for the entire frontal passage. With the ground as parched as it is, this meager water was soaked up immediately. It looks like we’ll have to wait a bit for a significant rain event. That rain event unfortunately probably will not come from the tropics, though this would be a very fruitful source if it did happen. The Hurricane Center is giving a 40% chance of development to an area of low pressure in the west Caribbean, designated 96L, which is forecast to move into the Gulf. However, models are all taking this disturbance into South Florida. Things can change, of course, but it’s uncommon to have this much agreement that close to a landfall and to have a shift of that magnitude. The next frontal passage will be this weekend, but this front is expected to be dry. It’s soon going to be tempting to have fall bonfires, but I don’t think it’s quite safe to do that just yet! Comments Off on Fall at Last, But When Will We Have Some Rain?